Cat ear mites are one of the most common cat illnesses. But are often not noticed by the cat owner until the condition has become quite a problem. They can be a constant problem for both you and your cat as they are contagious and can be passed to not only other cats but also to other animals living in the same environment. Cats rely on their hearing a great deal, it plays a vital role in their survival in the wild and while they are hunting. Their ears are designed in such a way as to pick up sounds easily. So that they can detect when another animal or danger nearby. Their ears are also Important for climbing and keeping their balance. 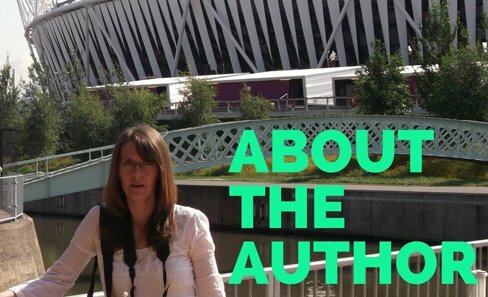 So any form of ear problems could cause them all sorts of difficulties. Well you dont want them to fall of the fence now do you? Cat Ear Mites, What Are They? Cat ear mites are small spider like insects. They can harm cat health by causing infection and even damage the eardrum, causing deafness. If viewed with the naked eye they look like small white dots against the dark earwax. The most common type of ear mite the otodectes cynotis lives on or just underneath the surface of the skin. They live for about 2 months and during that time they lay their eggs in the cats fur and ear canal. These eggs hatch after 4 days and the larvae emerge, which later become nymphs, which in turn become adult ear mites. Sounds horrible to me, who would like those living on you? The normal way your pet would get cat ear mites is from another cat. This might just be by sharing the same sleeping area, or just playing together. The mites can live for a time in the general environment of an infected animal as well. This means that your cat might just pass through an area frequented by a sick cat with the ear mites. So as you can see picking them up is quite easy. The symptoms of cat ear mites can vary from cat to cat. Some animals may be more sensitive to the mites and so show a more severe reaction to them. Scratching and itching around the ear. Wax dark in colour and has a strong odour. If you suspect that your cat does have ear mites but you cannot see them, it is best to take them to the vets who will use a special equipment to view the tiny critters. It is best to make sure that the symptoms are caused by mites and not another illness as the wrong diagnosis and treatment will make the situation worse. Once diagnosed cat ear mites must be treated quickly before they cause infection and further harm to cat health. 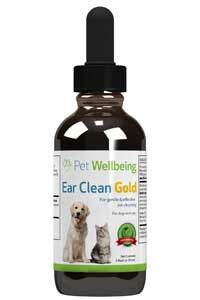 The vet will thoroughly and gently clean the ear of any discharge and earwax. This will remove some of the mites who are living amongst the hairs in the ears and also allow the medication to reach further in to all parts of the ear. The video below shows how a vet would do this effectively. Ear drops will be recommended by your vet and will probably be required to be given to your sick cat for a period of three weeks. Also treat the cats fur with a flea powder to kill off any eggs which might be stuck to the fur. If you have other pets it might be a good idea to get them checked as well. Thoroughly clean and wash any areas where your cat usually sits or sleeps and a good vacuuming of all carpets is also a good idea as an extra precaution. 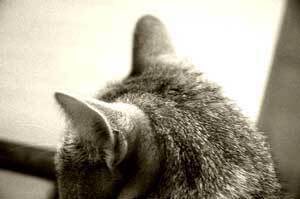 Because cats ears are so prominent they can be easily damaged in fights, often leading to torn of bitten ear flaps. If left untreated, infection could set in. So clean any minor cuts and scratches and seek medical advice for deep cuts. Sunburn, especially for cats with white tipped ears. Signs are reddening and swelling of the ear tips. See our other page on sunburn and summer care for further information. Fungal and bacterial infections. Possibly caused by grass seed or foreign body trapped in the ear. Symptoms are: head shaking and tilting as if trying to get something out of the ear. Tumour or Polyp in inner ear. Symptoms are: Head shaking and scratching with an audible fluid sound. Inner ear disease. Symptoms are: Loss of balance, head tilting, walking in circles and eye flickering. With any of the above, seek medical attention as soon as you notice the symptoms. 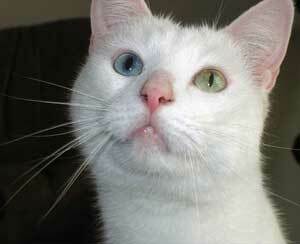 Some cats are born deaf, most commonly white cats with blue eyes. Some cats with different coloured eyes, say one blue the other brown may suffer from deafness on one side only. Cats who are completely deaf can be difficult to train and for their own safety should be kept indoors. They wont be alerted to dangers such as traffic noises and other cats. Similarly, if you notice your elderly cat suddenly deciding that its ok to sit in the road, it may have become too deaf to hear traffic. It may be time to keep them inside as well. If you do have to keep a cat in doors for its own safety, remember to make sure that they have plenty of stimulus and company. This will ensure that they continue to have a happy life. In conclusion, check your pet often for cat ear mites and other ear problems or cat illnesses and seek prompt attention. We have to check quite often as our cat has only one ear and she seems to always be getting things in it. Trouble is her middle name i think.